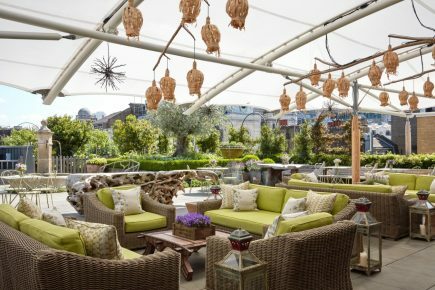 Returning for summer 2018, Ham Yard Hotel hosts its second Live Well Series, in partnership with Sweaty Betty and Psycle London to bring together experts across the health, fitness and wellbeing world for a series of inspiring sessions for busy Londoners looking to re-charge from their busy schedules. Psycle London will be offering weekend yoga classes on Ham Yard Hotel’s Roof Terrace followed by brunch, as well as evening Barre classes all summer long. Ham Yard will host a series of talks and sessions, ranging from guided meditation to empowering words from experts in the wellness industry curated by Sweaty Betty. Award-winning cookery author, Ella Mills, aka Deliciously Ella will also be debuting her new book and discussing the road from blogger to business woman. Live Well Series classes include Psycle London’s ‘Yoga & Brunch’ and talks include ‘How To Balance Your Hormones’. Soholistic Spa Specials will include discounts on luxury face and body experiences. From 21 July – 25 August.